Yemen national Abd al-Majeed al-Zindani is a U.S. and U.N.-designated recruiter and fundraiser for al-Qaeda and a reported “one-time mentor of Osama bin Laden,” according to the New York Times. Laura Kasinof and Scott Shane, “Radical Cleric Demands Ouster of Yemen Leader,” New York Times, March 1, 2011, http://www.nytimes.com/2011/03/02/world/middleeast/02yemen.html. The U.S. Treasury accuses al-Zindani of actively recruiting for al-Qaeda training camps and playing a “key role” in purchasing weapons for the terror group.“United States Designates bin Laden Loyalist,” U.S. Department of the Treasury, February 24, 2004, http://www.treasury.gov/press-center/press-releases/Pages/js1190.aspx. The U.S. also accuses him of financially supporting Hamas.“Union of Good,” U.S. Department of the Treasury, November 12, 2008, http://www.treasury.gov/resource-center/terrorist-illicit-finance/Pages/protecting-union-of-good.aspx. He is believed to operate out of Yemen.Margaret Coker, “Yemeni Sheik Courts, Warns Foreign Governments,” Wall Street Journal, January 12, 2010, http://www.wsj.com/articles/SB126321683002124521. According to the U.N., al-Zindani has provided “direct support to terrorism” and has directly influenced al-Qaeda leaders.“Security Council Committee pursuant to resolutions 1267 (1999) and 1989 (2011) concerning Al-Qaida and associated individuals and entities,” U.N. Security Council, accessed March 27, 2015, http://www.un.org/sc/committees/1267/individuals_associated_with_Al-Qaida.shtml. The red-bearded al-Zindani was at one point Osama bin Laden’s spiritual adviser“United States Designates bin Laden Loyalist,” U.S. Department of the Treasury, February 24, 2004, http://www.treasury.gov/press-center/press-releases/Pages/js1190.aspx. and was “one of the people closest” to bin Laden, according to bin Laden biographer Yossef Bodansky.Daniel Golden, “Western Scholars Play Key Role In Touting ‘Science’ of the Quran,” Wall Street Journal, January 23, 2002, http://www.wsj.com/articles/SB1011738146332966760. Al-Zindani subscribes to a conservative brand of Salafism that rejects Western influences and modern Islamic practices.Steven Erlanger, “At Yemen College, Scholarship and Jihadist Ideas,” New York Times, January 18, 2010, http://www.nytimes.com/2010/01/19/world/middleeast/19yemen.html. He is a vocal critic of the U.S. and blamed the 9/11 attacks on a Jewish conspiracy orchestrated by President George W. Bush.Josh Devon, “Yemeni Sheikh of Hate,” National Review, January 7, 2003, http://www.nationalreview.com/article/205426/yemeni-sheikh-hate-josh-devon. Al-Zindani reportedly believes in Bucailleism, a doctrine that alleges that the Big Bang theory and other scientific concepts originated in the Quran.Daniel Golden, “Western Scholars Play Key Role In Touting ‘Science’ of the Quran,” Wall Street Journal, January 23, 2002, http://www.wsj.com/articles/SB1011738146332966760. 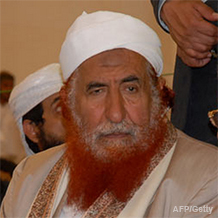 Al-Zindani claims he has developed cures for AIDS and heart disease, and believes that the U.S. designated him a terrorist because his AIDS cure would hurt pharmaceutical companies’ profits.Jane Ferguson, “Firebrand cleric walks a fine line in Yemen,” Al Jazeera, September 22, 2012, http://www.aljazeera.com/indepth/features/2012/09/2012921135824704254.html. Al-Zindani co-founded Yemen’s al-Islah (Reform) party, the local political arm of the Muslim Brotherhood.Farea al-Muslimi, “Yemen’s Brotherhood: Early Losses and an Unknown Future,” Al-Monitor, September 25, 2013, http://www.al-monitor.com/pulse/originals/2013/09/yemen-brotherhood-losses-unknown-future.html. Yemeni authorities have arrested several members for terrorism offenses.Evan Kohlman, “In Too Deep,” National Review, January 17, 2003, http://www.nationalreview.com/article/205561/too-deep-evan-kohlmann. Al-Zindani is also the founder of Yemen’s Al-Iman University, a Sunni religious school embroiled in controversy because of its affiliation with several high-profile terrorists. U.S. Taliban member John Walker Lindh is among its alumni and “Underwear bomber” Umar Farouk Abdulmatallab reportedly also attended, although the school denies this.Scott Peterson,” In Yemen, a university tied to ‘American Taliban’ and underwear bomber,” Christian Science Monitor, January 12, 2010, http://www.csmonitor.com/World/Middle-East/2010/0113/In-Yemen-a-university-tied-to-American-Taliban-and-underwear-bomber. The late al-Qaeda leader Anwar al-Awlaki spent time lecturing at the university.Scott Peterson,” In Yemen, a university tied to ‘American Taliban’ and underwear bomber,” Christian Science Monitor, January 12, 2010, http://www.csmonitor.com/World/Middle-East/2010/0113/In-Yemen-a-university-tied-to-American-Taliban-and-underwear-bomber. The U.S. has tied the 2002 murder of three American missionaries in Yemen“US missionaries murdered in Yemen,” BBC News, December 30, 2002, http://news.bbc.co.uk/2/hi/middle_east/2614091.stm. and the 2003 assassination of Yemeni Socialist party leader Jarallah Omar al-Kuhali“Jarallah Omar al-Kuhali,” Guardian, February 3, 2003, http://www.theguardian.com/news/2003/feb/04/guardianobituaries.brianwhitaker. to students from the university.“United States Designates bin Laden Loyalist,” U.S. Department of the Treasury, February 24, 2004, http://www.treasury.gov/press-center/press-releases/Pages/js1190.aspx. Al-Zindani dismisses accusations that the school encourages terrorism, saying teachers cannot be blamed for the actions of students.Scott Peterson,” In Yemen, a university tied to ‘American Taliban’ and underwear bomber,” Christian Science Monitor, January 12, 2010, http://www.csmonitor.com/World/Middle-East/2010/0113/In-Yemen-a-university-tied-to-American-Taliban-and-underwear-bomber. Abdelmajid Al-Zindani“United States Designates bin Laden Loyalist,” U.S. Department of the Treasury, February 24, 2004, http://www.treasury.gov/press-center/press-releases/Pages/js1190.aspx. Shaykh Abd Al-Majid Al-Zindani“United States Designates bin Laden Loyalist,” U.S. Department of the Treasury, February 24, 2004, http://www.treasury.gov/press-center/press-releases/Pages/js1190.aspx. Sheikh Abdul Majeed ZindaniDaniel Golden, “Western Scholars Play Key Role In Touting ‘Science’ of the Quran,” Wall Street Journal, January 23, 2002, http://www.wsj.com/articles/SB1011738146332966760. Abdul Majid al-ZindaniNasser Arrabyee, Alan Cowell, and Rick Gladstone, “Turmoil Over Contentious Video Spreads,” New York Times, September 13, 2012, http://www.nytimes.com/2012/09/14/world/middleeast/mideast-turmoil-spreads-to-us-embassy-in-yemen.html. Abd-Al-Majid Aziz Al-Zindani“Security Council Committee pursuant to resolutions 1267 (1999) and 1989 (2011) concerning Al-Qaida and associated individuals and entities,” U.N. Security Council, accessed March 27, 2015, http://www.un.org/sc/committees/1267/individuals_associated_with_Al-Qaida.shtml. The U.N. Security Council designated “Abd-Al-Majid Aziz Al-Zindani” as an individual associated with al-Qaeda on February 27, 2004.“Security Council Committee pursuant to resolutions 1267 (1999) and 1989 (2011) concerning Al-Qaida and associated individuals and entities,” U.N. Security Council, accessed March 27, 2015, http://www.un.org/sc/committees/1267/individuals_associated_with_Al-Qaida.shtml. The Department of the Treasury designated “Shaykh Abd-al-Majid al-Zindani” as a Specially Designated Global Terrorist (SDGT) on February 24, 2004.“United States Designates bin Laden Loyalist,” U.S. Department of the Treasury, February 24, 2004, http://www.treasury.gov/press-center/press-releases/Pages/js1190.aspx. Yemen national Abd al-Majeed al-Zindani is a U.S. and U.N.-designated recruiter and fundraiser for al-Qaeda and a reported “one-time mentor of Osama bin Laden,” according to the New York Times. “An Islamic state is coming!… [President Saleh] came to power by force, and stayed in power by force, and the only way to get rid of him is through the force of the people.”Laura Kasinof and Scott Shane, “Radical Cleric Demands Ouster of Yemen Leader,” New York Times, March 1, 2011, http://www.nytimes.com/2011/03/02/world/middleeast/02yemen.html. “The U.K. request for an international conference on Yemen is meant to pave the way for a U.N. Security Council resolution to approve an occupation of Yemen and to put it under a U.N. mandate.”Steven Erlanger, “At Yemen College, Scholarship and Jihadist Ideas,” New York Times, January 18, 2010, http://www.nytimes.com/2010/01/19/world/middleeast/19yemen.html. “We accept any [international security] cooperation in a framework of mutual respect and common interest. But if someone occupies your country ... a Muslim has a duty to defend [against such invaders].”Margaret Coker, “Yemeni Sheik Courts, Warns Foreign Governments,” Wall Street Journal, January 12, 2010, http://www.wsj.com/articles/SB126321683002124521. “I am a general lecturer and a writer of books. If someone says they listened to my lectures or read my books, am I to blame if he then, say, divorces his wife, or if he attacks someone? If that’s the case, then all teachers and professors should be accused.”Scott Peterson,” In Yemen, a university tied to ‘American Taliban’ and underwear bomber,” Christian Science Monitor, January 12, 2010, http://www.csmonitor.com/World/Middle-East/2010/0113/In-Yemen-a-university-tied-to-American-Taliban-and-underwear-bomber. “Who is the terrorist and what is terrorism? I think it applies to anyone who is against Western or American policy.”Susan Sachs, “A NATION CHALLENGED: MILITANTS; Yemen Fears Being Singed by a Home-Grown Firebrand,” New York Times, February 15, 2002, http://www.nytimes.com/2002/02/15/world/a-nation-challenged-militants-yemen-fears-being-singed-by-a-home-grown-firebrand.html.